Explanation: Does air glow? It does, but it is usually hard to see. When conditions are right, however, a faint glow about 90 kilometers up can be observed, most easily with a wide-angle long-duration camera exposure. The same airglow can also frequently be seen looking down -- in pictures taken from Earth orbit -- as a faint arc hovering above the surface. 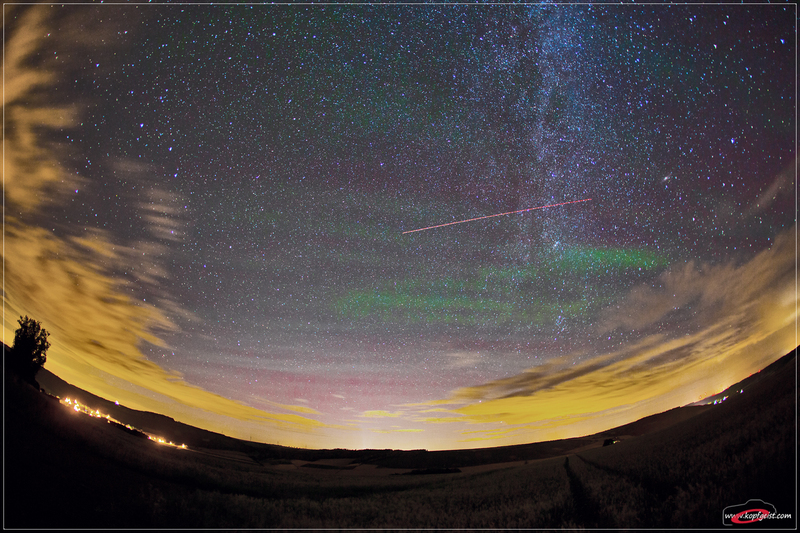 Pictured above between the beige clouds, above the curving Earth, behind the streaking airplane, and in front of the sparkling stars are some green bands of airglow. The glow is predominantly created by the excitation of atoms by ultraviolet light from the Sun, with the bands resulting from density fluctuations caused by upward moving atmospheric gravity waves. The above image was taken in mid-July above Weikersheim, Germany. Lightning and aurorae can also cause air to glow, but result from particle collisions and are more fleeting.